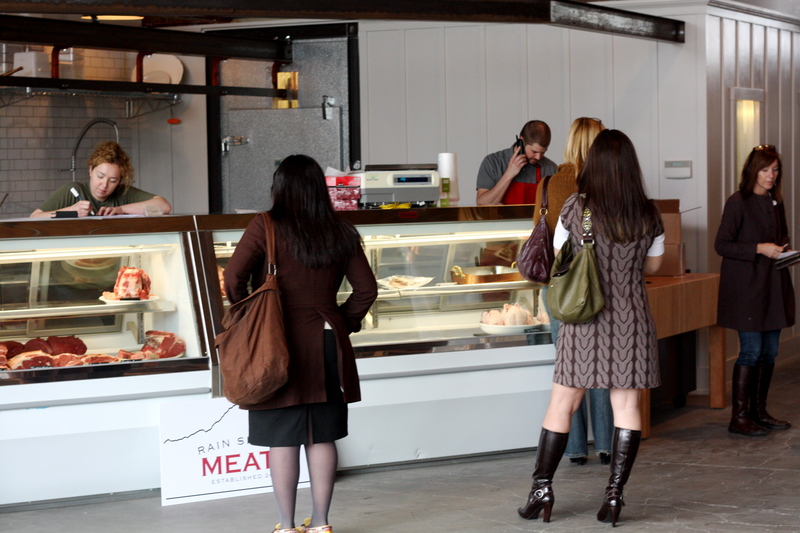 Capitol Hill now has an indie butcher. And an indie cheese monger. And we get these riches on the same day. 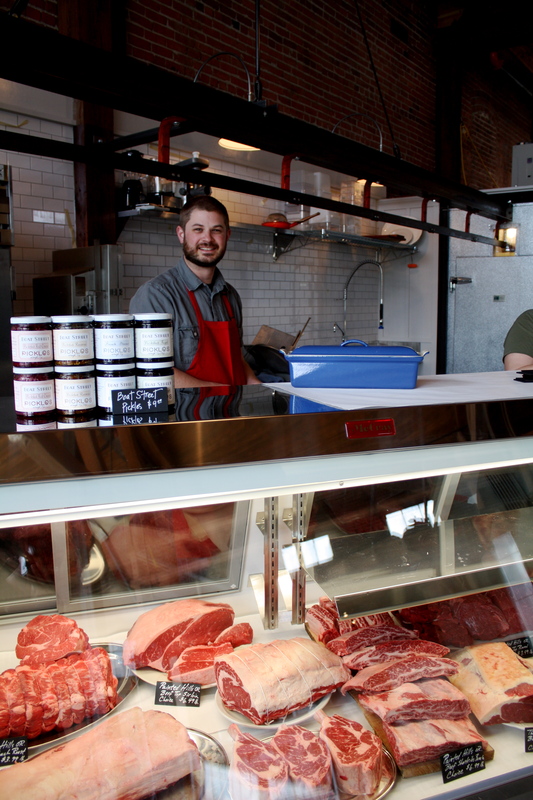 The Calf and Kid Artisan Cheese Shop and butcher Rain Shadow Meats opened for business this morning in the still-under-construction Melrose Project. Around the market, construction continues on the spaces that will eventually be home to Sitka and Spruce and Homegrown Sandwiches. Meanwhile, Sheri Lavigne also was settling in for her first day in business at the counter across from Rain Shadow. Lavigne reports that Calf and Kid’s first transaction was for a slab of grande queso from Blue Rose Dairy of lovely Winlock, Washington. We profiled the new Cap Hill biz owner here. Both shop owners said they’ll be open to at least 7 PM tonight but Lavigne said she’ll hang around as late as people keep buying cheese. Regular Saturday hours are 11 AM to 7 PM and 12 PM to 6 PM on Sundays. Nice! I got NY from the butcher in mad valley this week as well. If that was beef… What have I been eatting all these years? Is there a veggie option? Does there always have to be? New vegan restaurant from the people that brought you the Squid & Ink will be appearing on Broadway in the old Club Lagoon space hopefully soon. Also, I am sure Sitka & Spruce will have veggie items. This is Seattle after all. What a combo! Does either carry charcuterie of any kind? 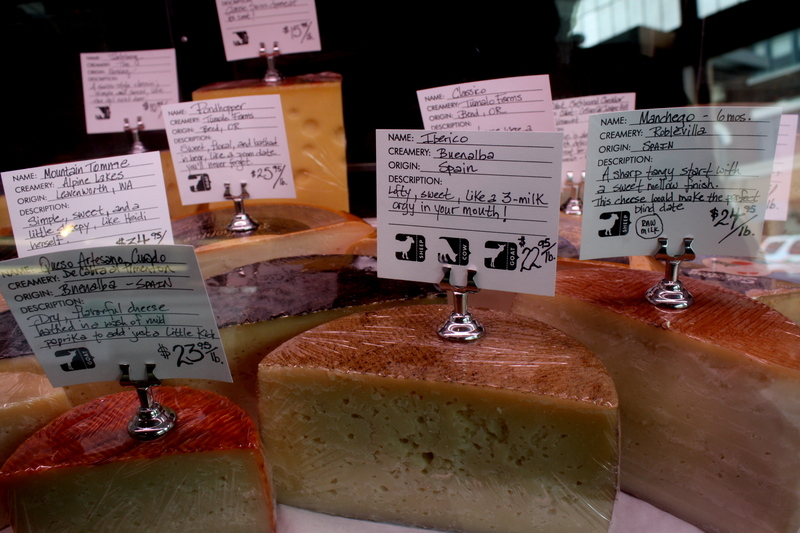 I’d love to have a local place to pick up cheese and salami. Bonus points if they sell bread as well! The butcher has a curing room I think so I’m betting charcuterie is a yes. And I believe Sheri at Calf & Kid is selling baguettes. I think in an earlier story they talked of the salami that they were making exclusively for their shop and the sandwich shop. I’m so looking forward to giving some of my grocery dollars to these establishments. There is no comparison to a quality butcher shop and grocery store cuts of meat. Will there be cured meats as well? Never mind with the cured meats question; I see others are interested in that question as well. No, you’re talking about a different markup, and a different business model. Nobody’s going to pay the same for “gourmet” veggies. abour all your soy… according to PBS 2 hrs of TV yesterday, 98% of soy grown in America is Monsanto brand genetically modified . And the farmer isn’t allowed to grow anything else, he gets sued. Clarence Thomas wrote the supreme court decision saying trademarks extend to foods. Before being on the Supreme Court, Thomas worked for Monsanto corp. So while you think you’re helping the environment you’re actually lining Monsanto lawyers pockets, for them to go out and sue. If there’s niche soybeans, the show did not say. One got the impression not, because it was illegal to even save the seeds from soybeans now, Monsanto issues takedown lawsuits on anyone that tries. Support local butchers, eat unadulterated meat. Like people have done for centuries before corporate farming entered into it. Word to you mom, g.